A throng of immaculately-dressed, strikingly manicured individuals stood in compacted disarray, their shadows reflected in the sheen of the glimmering marble and mirrors that adorn much of the foyer of Miami Beach’s luxurious Fontainebleau Hotel. A frenzied sense of desperation began to emanate, as many attempted to get into the best party on the beach that night. Many would-be patrons exited in defeat, realizing that the degree of difficulty in getting in was far too great. On this particular evening, superstar Scottish electro house DJ/Producer, Calvin Harris was poisedto take control of the decks – unleashing his meticulously polished, pop-infused beats on a capacity crowd. Upon gaining access to the area beyond the velvet rope, the unmitigated grandeur of LIV night club becomes starkly apparent to even the most discriminating of club goers. The ceiling is a cascade of shimmering lights, alternating in synchrony to the beats being issued forth from every conceivable angle, like a salvo of gunfire. Harris emerged onto the podium at 1:30 AM, playing a two hour set that immediately exhibited its strong electro bent by kicking off with a track by Dutch maestro Hardwell. The track selection was remarkably strong, vacillating fluidly from the frenetically-paced, almost riotous electro featured on tracks such as Harris’ production “Awooga,” to some slower burners – namely “Feel So Close,” “You Used to Hold Me,” and his collaborative track “We Found Love,” featuring Rihanna on vocals. Flaming, glow-in-the-dark bottles of Dom Perignon were transported, seemingly without cease,to the many VIP areas in the club, as Harris continued to wreak havoc behind the decks, manipulating each track to perfection – completely negating the fact that he had chosen to go in a decidedly mainstream direction in terms of what was played. 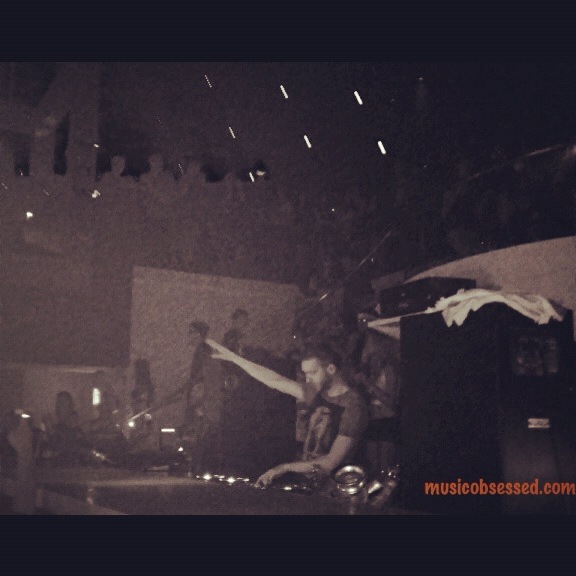 Harris’ capabilities as a DJ directly parallel his mastery of production, which is surprising in an era where the craft of mixing seems have become supplanted, and at times, overshadowed by the emphasis placed on production – as evidenced by the traction that the Swedish house scene has gained in the international realm. It was an evening of lavish excess that encapsulated everything that makes Miami night life the standard for the industry everywhere else, and even still, they can only muster a cheap facsimile.